One could say that Sjöwall and Wahlöö are the grandfathers of Swedish crime. They wrote long before Nordic crime was the thing it has become. Their Martin Beck series is said to be one of the best around. A true classic. While the books have been around for as long as I can think, I never picked one up, although I have always been curious. Now, finally, because I was looking for a locked room mystery, I came across the eight title in the Martin Beck series, The Locked Room, and thought I’ll give it a try. I know it’s not ideal to start with book eight in a series but it was OK. I never felt liked I was missing a ton of information. According to Michael Connelly, who wrote the introduction to this book, it’s one of their best. This book was not what I’ve expected. It was so much better. So good in fact that I immediately downloaded the first in the series. Detective Inspector Martin Beck isn’t the central character in this book because he’s been shot and only just returned to work after an eighteen month break. To help him get back into the routine, he’s been assigned a minor case. A man has shot himself and Beck has to wrap up the case. Parallel to this case, we follow the police investigating a bank robbery that has gone terribly wrong. One of the customers was shot. For years, the police have tried to catch a group of bank robbers, but they always escaped. The police are pretty sure that the robbers they are chasing, robbed this bank as well, even though they never shot anyone before. The readers know from the beginning that someone else has robbed the bank. We also learn that the suicide Beck investigates was a murder. The man was found dead, shot, in a locked room and no weapon could be found. These are two very different cases. The one Beck investigates is more suspenseful as we only know as much as Beck knows. The other case is rather hilarious. And this is exactly why this series surprised me so much and why I loved this book. 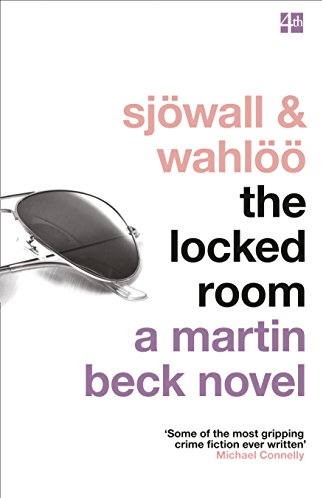 Very obviously Sjöwall and Wahlöö were very fond of their character Beck. Beck, who is a bit of a loner, is very intelligent, a thinker, slightly sarcastic and disillusioned but not bitter. His colleagues aren’t too keen on him, they find him bizarre and too unconventional. He’s definitely an outsider. While we can feel how much the authors like Beck, we also notice quickly, how little they think of the police in general. They make fun of the bank robbery squad wherever they can. More than one of their missions turns into a farce. Some of these characters are very likeable too but dorky. Others, especially those higher up in the ranks are just clueless. I really enjoyed the mix of such different cases. The quiet, introspective case Beck was on and the big bank robbery investigation that took surprising turns and had many funny moments. Another aspect I liked was that the book was full of social criticism. It’s really quite harsh in places. The authors excoriate Swedish society and politics. I know that Beck is more prominent in the earlier books, so I can’t wait to read a novel in which he gets more room. He’s a great character. All in all, a very pleasant surprise. Sharp, pithy writing, combined with dry humour, appealing characters, a realistic setting, and two interesting cases. What more could you want? The original and the best, to my mind, of Scandinavian crime fiction! So pleased you’ve started reading them. Although they don’t need to be read in order, strictly speaking, and I find Roseanne (the first in the series) perhaps the dullest one. Too bad it’s not as good but I’m still keen on starting the series. The kindle versions are very affordable. I loved their sense of humor and Beck us great. Glad to hear you like it as well. I totally agree with Marina Sofia – this is definitely the best of the Scandinavian crime fiction. I read the whole series pre-blog and absolutely loved them. I think the idea of reading them in order is that they were written over a period of time (the 1960s to early 1970s) when Sweden went through a whole lot of changes and these are reflected and covered in the books – which I believe was the intention of the authors. You make me want to read them all over again…. Another fan. I’m so pleased. I never see them reviewe. It was so good. I’m really looking forward to more. I was very surprised by their harsh views on Sweden. I always idealize it a bit. Obviously Sweden has undergone more changes since the 60s/70s. I’ve been in a similar position to you for quite a few years, forever curious about these books but never quite getting around to trying one. I really must remedy that at some point as they sound truly excellent. As far as I’m aware, socio-political dimension was a key element of their approach. I recall seeing a TV programme about them a few years ago. If my memory serves me correctly, I think they wrote alternate chapters of each book, mainly at night when their kids were in bed. I have only ever heard they were good but nothing specific, so the whole socio-political dimension was a surprise. It’s one aspect that made it so good. It’s just very fresh as some of their comments were so frank. The opposite of tame. I hope you’ll give them a try some day. I read that too about the alternating chapters. Thanks you, Vishy. I’m glad you liked it. I can see why they were so influential and still considered among the very best. In many ways the tone felt more modern. I hope you’ll pick the series up again. Great review! I read and enjoyed ‘Roseanne’ earlier this year and fully intended to read more of the Beck series, but I’ve had so many other books in my TBR pile I haven’t got round to it yet. I really like Martin Beck as a character, but love the idea that in some books he takes a back seat so that other characters can emerge more fully. I’m going to order the second title right away! Thank you, Sarah. I’m so glad to hear you liked Roseanne as I’ll be reading that soon. He’s a very likable character. Having him as a minor character and adding a second investigation made this quite original. I hope you’ll enjoy the next one in the series. I haven’t read the second one yet, either, but I did really enjoy the first, and I’m pleased to hear that you found the 8th such a hit! It’s wonderful when a crime classic truly holds up, isn’t it? I agree, it’s great when they hold up. It felt fresher than many contemporary novels. Nowadays, so many books are so tailored. If you know what I mean. Being so much older, it is no surprise that this sounds very different from the newer Swedish Crime novels that I have heard of. Sometimes I find that having parallel stories contained in a novel makes that novel seem a little disjointed. Did you find that was the case with this book? It was a little disjointed but it did work. The investigations, or rather the people, overlapped. It felt quite realistic. Well, I’ve become a big fan of Nordic crime, so will have to give this series a try. Thanks for the heads-up, Caroline. Don’t get me wron, I like contemporary Nordic crime but it was nice to see where it all started. And I liked it a great deal. I hope you will like them as well. I’ve read a couple of this series – a lot shorter than contemporary Nordic crime novels generally are! Have you seen the Beck television series? Per Wahloo also wrote alone – I’ve read Murder on the Thirty-first Floor which is also a crime novel but set in a dystopian future. That dystopian one sounds interesting. I think Sjöwall died after they wrote book 10 of this series. You’re so right about the length. I hadn’t thought of it. No, I haven’t watched the series. I would like to but I want to read some more of the novels first. I read one in the series, Roseanna, and I didn’t care for it. Put me off the rest of the series, so it sounds as though you had a lucky break finding a good one. Marina mentioned that Roseanne was the weakest. Now I’m not sure what to do. Maybe skip it and read the second.